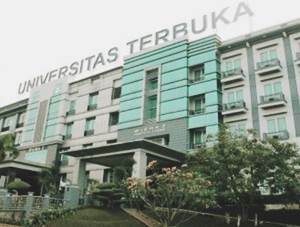 Universitas Terbuka - UT is Indonesia Open University. UT is one of the most reliable and leading Indonesian state-university which applied a distance and open learning systems. UT is wholly-owned by the Government of Indonesia through the Ministry of Research, Technology and Higher Education. UT is the 45th state university in Indonesia. UT was established as a Government-owned university in 1984 under the Presidential Decree No 41 of 1984. UT has its legal domicile in South Tangerang and its head office is located at Jl Cabe Raya, Pondok Cabe, Pamulang, South Tangerang Banten 15418. UT now has 39 Distance Learning Program Units (UPBJJ-UT) spread across Indonesia. According to UT's profile as cited by JobsCDC.com, Indonesia Open University offers more than 34 courses which include Undergraduate Program (S1), Master Program (S2), Diploma Program (D1, D2, D3, and D4), and Certificate Program. UT now has 4 faculties; the Faculty of Economics (FEKON), the Faculty of Education and Teacher Training (FKIP), the Faculty of Mathematics and Natural Sciences (FMIPA), and the Faculty of Social and Political Sciences (FISIP). Indonesia Open University also host 1 post graduate program and 1 certified program. Maximum age of 35 years old on 31 December 2017. Minimum accreditation diploma "B" on the graduation year, by showing the accreditation certificate majors from the campus. Mastering office applications: Microsoft Word, Excel, Power Point etc. Able to work outside office hours. Able to work hard with the team. Experienced in the field at least 1 year. S1 and S2 certificate of Information Systems Study Program. Have experience as a lecture assistant or practicum. JobsCDC.com now available on android device. Download now on Google Play here. Please be aware of recruitment fraud. The entire stage of this selection process is free of charge. Universitas Terbuka - Lecturer of Information Systems TKT Non CPNS UT October 2017 will never ask for fees or upfront payments for any purposes during the recruitment process such as transportation and accommodation.